Ever wondered how to use your bullet journal for more productivity? Well, me too. That‘s why I was searching for ways to do exactly that. And I found them. I am even willing to share them with you, so you can be your most productive self using your bullet journal. I don‘t want to ramble on too much, so let‘s just dive in. If you spend too much time on the journal itself, well, that is not going to make you more productive. For me, that is a way to procrastinate because I somehow still have the feeling that I do something productive, even though I only glue pictures in my journal. Don‘t let your focus be on your journal, no matter how much fun it is. 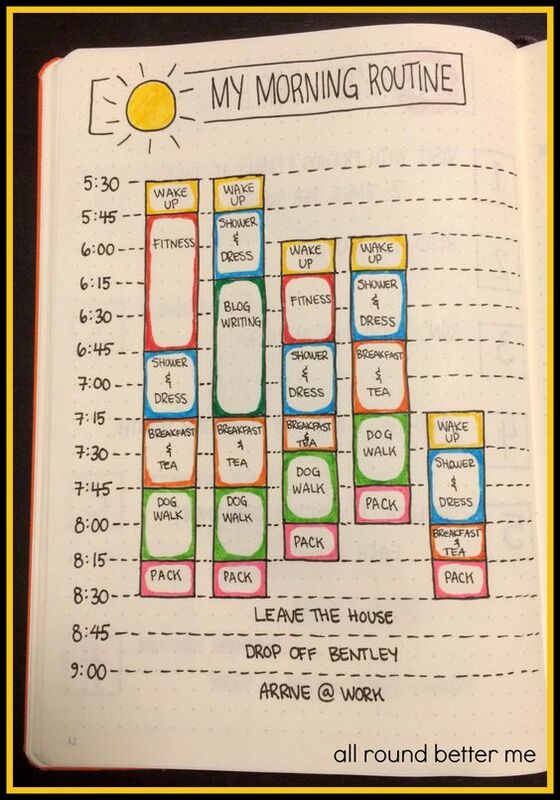 Use it to plan your day and write out your to-dos but after that get to work. Also it is a lot easier to see what you have planned and what you have to do if your journal is simple and not overly complicated. Experiment with different spreads so you find the best one for you. If you want to read more about these pages/components of the bullet journal, click here. This is something that made me crazy productive. If you are not familiar with the term habit tracker, basically you write a list of things you want to do everyday and the days from 1-30/31 for the month. Then you go back to that at the end of the day and check off what you accomplished. Be careful of what do you put on your habit tracker. I was always very tempted to do all the things on the list, so I had a 100% day. That means that you are going to really do the things that you put on the list (ideally). These things are going to shape your day and your life. So be mindful when you choose the tasks you want to put in there. I think a great way to approach that is to focus on one thing. For example, if you want to get healthier, put such as ‚workout‘, ‚clean eating‘, ‚went walking‘ on your list. You can choose 2-3 things you want to focus on, so you can extend this list with tasks for your blog. So you would also add ‚write blog post‘, ‚answer to comments‘. If you really want to use your journal for productivity, first: write down every little task you have to do, notes, brainstorm in it, whatever comes to your mind. Then take your journal everywhere with you. This way you can always check on your tasks if you happen to have free time on your hands that you don‘t know how to spend. You can also write down ideas and such as they come to you, even if you are not home. This kind of ties in with the habit tracker. Identify your goals for the year, month, week or even day. Once you know what you want to carry out, write it down. This is really important: it is not the same to think about something and to really write it down. By writing it in your journal you really signalize that you are serious about it. Then find the steps you have to take to get to that goal. Do this with yearly goals, monthly goals, weekly goals and with daily goals. After that you only have to create a to-do list of that steps and get to work! You are not going to be very productive if you are burned out from stress and doing too much. It is important to take care of yourself and have fun. So create a page for self-care ideas that you can do when you need to get away from work for a little. For example: ‚grab an icecream‘, ‚watch a movie‘, ‚dance around living room‘ or ‚take a bath‘. Whatever you know will help you relax or get work off of your mind for a little. 7 Also: don‘t forget to plan in breaks!! Very important: plan in breaks. Don‘t plan your whole day without including breaks. First: it is not realistic to fully plan out a day without breaks, you are going to need them and afterwards you are going to feel bad for not keeping up with your plan for the day. Second: if you don‘t take breaks, you are not going to be your best. You need a break once in a while. So it is better to plan in longer breaks than you would think you need them and start working again earlier if you feel like you don‘t end up needing that long of a break. To make sure that you start the day right and set the tone for your whole day, create a morning routine page. Think about what would help you be productive the whole day. Maybe doing some yoga and having a big breakfast? Whatever it may be, create a morning routine and jot it down in your journal. Equally important: a night routine. Find out what you need to do to calm down and sleep well. You could even create different routines for different days.